1. CHANGED: Has there been a change in my life? Simon became Peter. A fisherman & failed follower of Christ became leader of the Gospel movement b/c of his relationship with Christ.1 Peter 1:3. You’ll not come in contact with Jesus & not be changed in some way. 2. SUBMISSION: Can I say that selflessness & servanthood toward God & others is part of my identity? 1 Peter 2:13,18; Matthew 20:28. Peter was known in the Gospel for his assertiveness & brashness. But he learned that in Christ, SUBMISSION was the greater value. 3. SUFFERING: If following Christ cost me something, would I still do it? 1 Peter 4:1. Suffering & Christianity are inextricable linked. Why? Peter reminds us that we’re not of this world, so we can expect to rub this world the wrong way. And we’re going against the flow of our fleshly nature & cultural norms, so sparks will fly when our identity in Christ meets these two. 4. 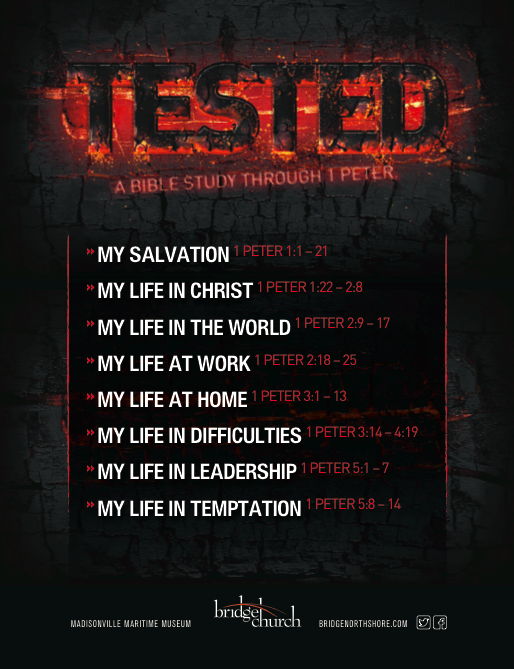 READINESS: Am I ready with everyday discipline in my Christian life (1 Peter 1:13)? Am I ready to share the Gospel with others (1 Peter 3:15)? Am I ready to face temptation & the tempter who desires my destruction (1 Peter 5:8)? In the Garden of Gethsamane he slept when Jesus as him to pray, so he tells us to “Stay awake” 1 Peter 5:8. When Jesus was arrested, he reacted by trying to commit murder, so he tells us to “Be sober” 1 Peter 1:13. He denied Christ three times even though he said he wouldn’t, so he tells us to “Be ready to give an answer” 1 Peter 3:15. Great study & great book for our generation to study as we face more & more pressure because of our faith in Christ. Find most of the messages at http://bridgenorthshore.podomatic.com/ or on our Itunes account. Posted on April 16, 2015, in Bridge Church, Message Notes and tagged 1 Peter, Discipleship, Sermon Notes. Bookmark the permalink. 1 Comment. Sounds like the Holy Spirit is moving at Bridge Church. Wish I could have been there for the study.